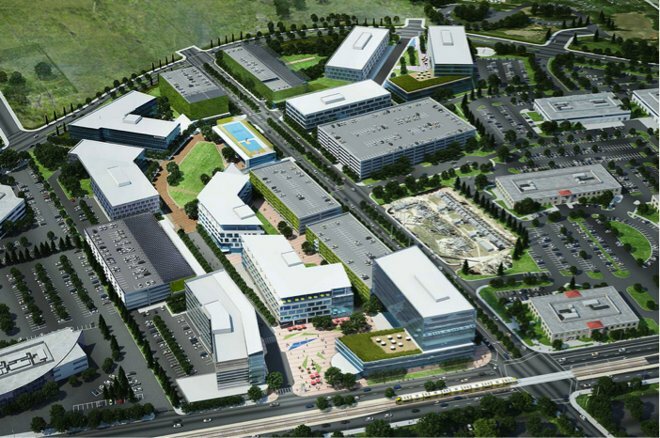 Apple's seemingly insatiable appetite for Silicon Valley office space has reportedly led the company to acquire an undeveloped 43-acre site in San Jose, a deal worth $138 million that could add as much as 2.8 million square feet of space to Apple's inventory. The San Jose site is located on North First Street, according to the Silicon Valley Business Journal, within shouting distance of fellow tech giants like Cisco and Samsung. Apple purchased the tract from real estate investment firm Lowe Enterprises, which had previously intended to develop the site into an "urban-style" campus with nearly 2 million square feet of office space. San Jose planners have approved the building of up to 2.8 million square feet of office space on the site, and it remains unclear exactly what direction Apple intends to take. The latter figure would put Apple's potential new development on par with its spaceship campus in Cupertino when it comes to floor space. Apple has been rumored to be mulling an expansion to San Jose for some time, given the city's proximity to Cupertino and the fact that a significant portion of Apple's workforce already lives in San Jose. Apple's new site is situated across from the 101 Tech development, where the company signed a lease for 300,000 square feet last month. In addition to the office space, the Journal reports that "Apple has been in the market for broad swaths of heavy R&D and industrial space," suggesting that the company is working on a major expansion of its research and development operations that are thought to include a self-driving car. Apple's new spaceship campus will come with 600,000 square feet of dedicated R&D space.